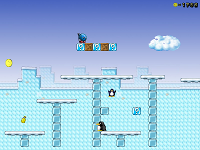 I am a big fan of SuperTux, a game very similar to classic jump'n'run games such as "Super Mario Land" and "Super Mario World". 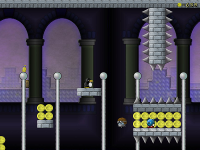 After completing all the regular levels and most of the contributed levels, I started making some levels of my own. Later, after discovering the SNES game "Super Mario World" again (that game is brilliant and totally wasted on kids! 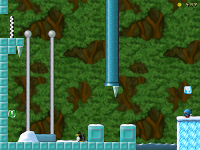 ;), I started to adapt some of the original levels for SuperTux. 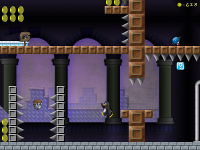 I packaged the levels as an add-on. To install the packages, simply download the Zip file to ~/.supertux2/ and restart the game. 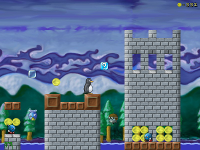 Tux needs to get into the castle, but it's heavily guarded. Tux is inside the castle, but not quite. To get to Penny he has to get past the guards in the outer regions of the castle. Because this is a hard level is has been made optional. Finally within the inner regions of the castle, Tux has to discover that that Badguy is having a new heating system installed and not where he used to be, so ... were could he and Penny be? If Badguy is not on his throne, he can only be in one of two places. To the torture chamber! Well, Badguy and Penny weren't in the torture chamber either (whew!). So off to check the second possibility: Badguy's private chambers, way up in that devious tower of his. This is a remake of the original "Yoshi's Island 2" level from "Super Mario World", the SNES game. 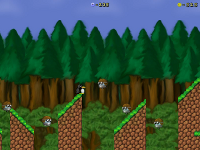 Everyone who has played the original game will know this level from heart, as it is the level to gather some extra lives. 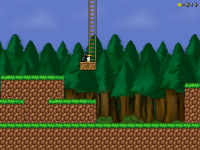 This is a remake of the original "Chocolate Island 2" level from "Super Mario World", the SNES game. 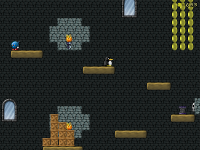 Getting to the secret exit is a bit tricky but should behave almost identical to the original game. 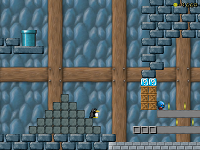 This is a remake of the original "1-1" level from "Super Mario Land", the GameBoy game. 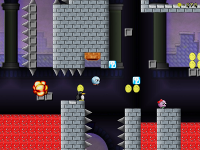 This is a remake of the original "1-2" level from "Super Mario Land", the GameBoy game. 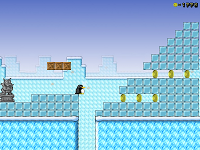 This is a remake of the original "1-3" level from "Super Mario Land", the GameBoy game. All my levels are dual-licensed under the GNU General Public License (version 2 or later) and the Creative Commons Attribution-Share Alike 3.0 License (CC-by-sa 3.0).